A pleasant conceited comedie called, Loues labors lost. Title: A pleasant conceited comedie called, Loues labors lost. As it vvas presented before her Highnes this last Christmas. Newly corrected and augmented by W. Shakespere. Date: Imprinted at London : By W[illiam] W[hite] for Cutbert Burby, 1598. A pleasant conceited comedie called, Loues labors lost. As it vvas presented before her Highnes this last Christmas. Newly corrected and augmented by W. Shakespere. Imprinted at London : By W[illiam] W[hite] for Cutbert Burby, 1598. 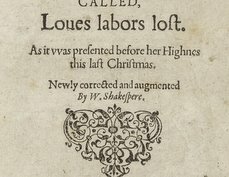 William Shakespeare's name first appeared on the title pages of three plays in 1598, including this edition of Love's Labor's Lost. Fourteen copies of this edition are known to survive. 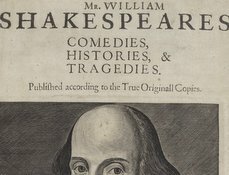 The sub-title, "Newly corrected and augmented By W. Shakespere," has led scholars to speculate that there was an earlier edition of the play that has not survived. Some scholars have suggested that it might have been written as early as 1589, based on contemporary allusions within the text of the play. 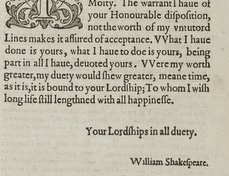 Whatever its date of creation, Love's Labor's Lost is the earliest Shakespeare comedy to survive in published form. 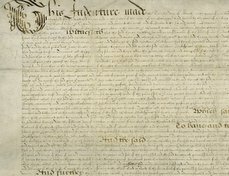 This copy, one of three owned by the Folger, was acquired by Mr. and Mrs. Folger from the collection of John Gott, Bishop of Truro, around the time of Gott’s death in July 1906. Michael Baird Saenger, "Nashe, Moth, and the date of Love's Labour's Lost," Notes and Queries 45, no. 3 (1998), 357-358. Paul Werstine, "The Hickmott-Dartmouth Copy Of Love’s Labour’s Lost Q1 (1598)," Notes and Queries 32 no. 4 (1985), 473.